Eyes Open Wide: Here's One For The Books! Here's my mentor experiencing spiritual growth at a recent musical event in Virginia Beach! 1. Just when did "raised hands" become the universal Evangelical symbol for worship? 2. Just when did "christian music" become synonymous with "worship"? Comments are open... insight is sought. Don't let me down, Anonymous commentors! 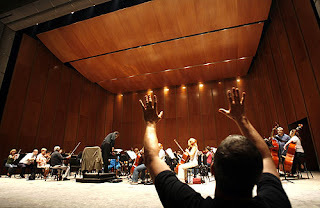 Perhaps he was merely using his telekinetic powers to command the orchestra shell ceiling to "rise up!" What was the orchestra performing? Being an orchestra member, it's obvious by the angle of the various bows and the postures of the musicians and the fact that the conductor is bent over his score, that this was a rehearsal, or the orchestra was not currently playing. You are correct... it was a rehersal - but a good piture, don't you think?